TradeMark Media brought our website into the right decade, maintaining excellent communication and keeping clearly scheduled deadlines throughout … We’re thrilled with our new site and already see evidence of how it’s better serving our users. 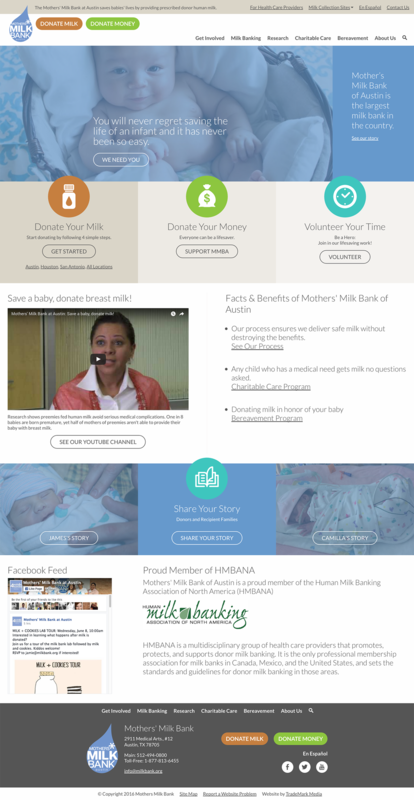 Since its inception in 1999, the Mothers’ Milk Bank at Austin—the largest of its kind in the country—has dispensed more than four million ounces of pasteurized milk to pre-term and medically fragile babies in Texas and around the U.S. So why wasn’t its old website effectively making the case for its mission? For starters, it was visually lackluster and featured a site architecture that didn’t perfectly align with its operations and users’ needs. But more importantly, nonprofit organizations—especially those that depend so heavily on volunteers—must convey a sense of professionalism and authority. Users should land on a nonprofit site and, within seconds,sense that this organization can be trusted. Internet surfers grow savvier every day. What users once considered a luxury—e.g., mobile-responsive websites—are now expected. Organizations whose websites just look and feel outdated immediately lose some credibility with their users. This went a long way toward “designing trust.” Now, users can immediately see and feel the MMB’s size, scope, and commitment to its mission. Fluid page width—i.e., the website stretches to the edges of whatever screen it’s being viewed on—is beneficial to larger screens, which are becoming more prevalent. Whenever we construct a website, we aim to incorporate at least “one new thing.” In other words, we don’t want to offer cookie-cutter solutions to non-cookie-cutter organizations. In this case, we sprinkled a number of these subtle, yet differentiating, elements throughout the new MMB site. 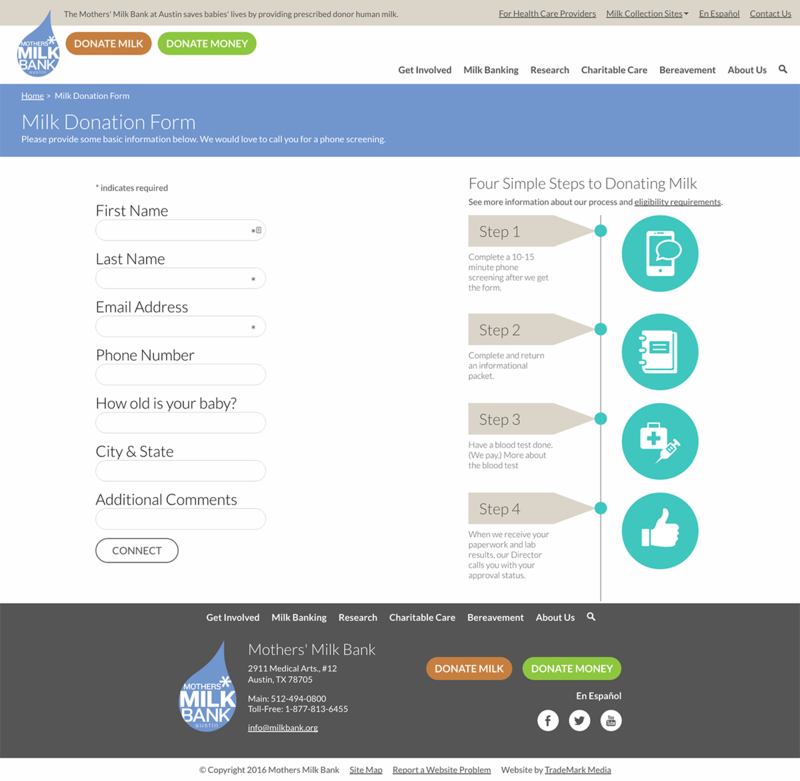 Mothers’ Milk Bank enjoyed a 386% increase in online donor requests while working with our team.